The current state of my sour beer cellar. 20+ vessels (mostly 1-gallon) in various states of aging. It’s been well over a year since I started my bioreactor project. What started as a method to maintain a single ‘house’ mixed culture has grown into maintaining 3 separate and distinct mixed cultures. Each of these cultures is refreshed every 4 months by brewing a new 3-gallon batch of beer and splitting it into (3) 1-gallon jugs for each culture. In addition to the 1-gallon refreshes, with every refresh I grow up a separate large slurry of one of the cultures and pitch it into a larger 3-gallon test batch. Over a year in, the first of the cultures, “Culture A” (I know, very creative) has begun to produce the first finished 1-gallon batches of beer. The recipe for this beer and review is below. Quite fruity and tart on the nose with aromas reminiscent of sour cherry, berries, and perhaps a little tart apple. There is a fair amount of Brett funk on the nose—hay, leather, wet earth, and then some cinnamon-like spice with a touch of plastic-like phenol. The beer paints a deep golden hue with crystal clarity. The beer pours with a nice, white foam, but quickly dissipates, likely due to lactobacillus’ ability to degrade foam positive proteins. The beer leaves an initial impression of stark dryness and acidity though manages to balance with just a touch of residual malt sweetness. There is a low crackery malt character that is amplified by a hint of Cheerios-like THP. 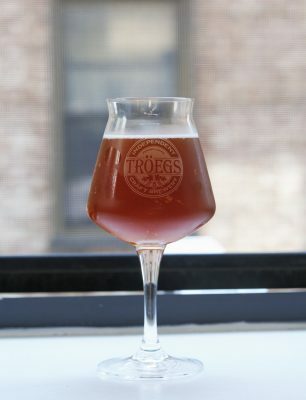 The beer has a tannic character that is reminiscent of apple skins. 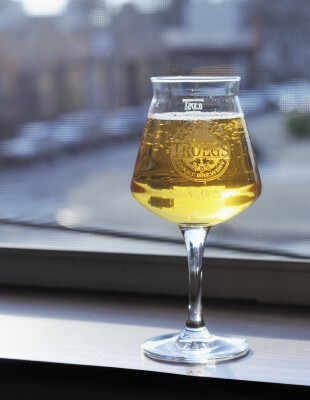 Most of the funk exhibited on the nose is subdued on the palate. The acidity is primarily lactic in nature, which is somewhat surprising considering the abundant amount of head space that was in the carboy during aging. The beer manages to feel crisp in spite of what is a fairly low level of carbonation. The acidity is soft and round not sharp or biting. A little bit more carbonation would be a welcome addition. This is a very nice, refreshing sour beer with just enough funky Brett aromatics to keep it interesting. While blending is typical in sour beer production, this beer manages to remain somewhat balanced without any additional intervention. 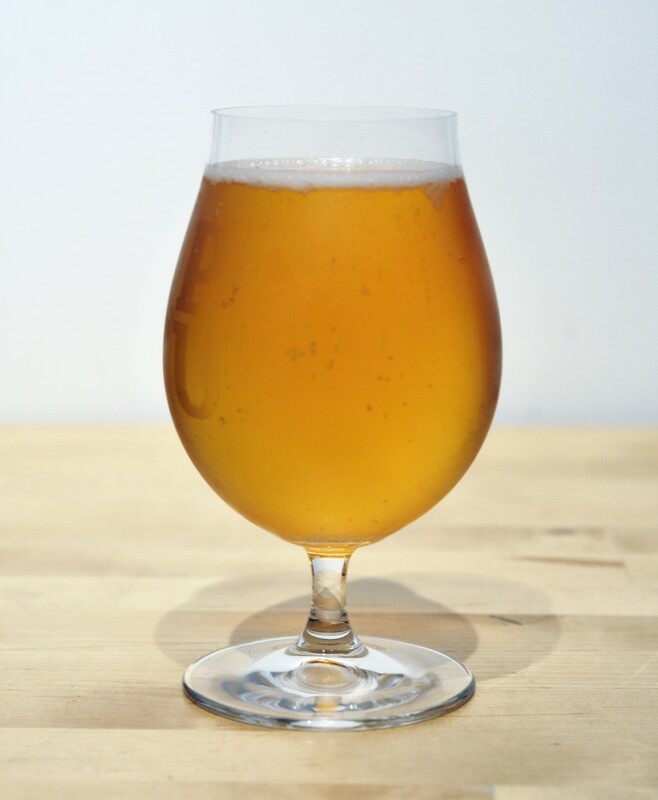 It seems that more and more breweries are beginning to incorporate Brettanomyces into their brewing repertoire. When done well, I’m a huge fan. 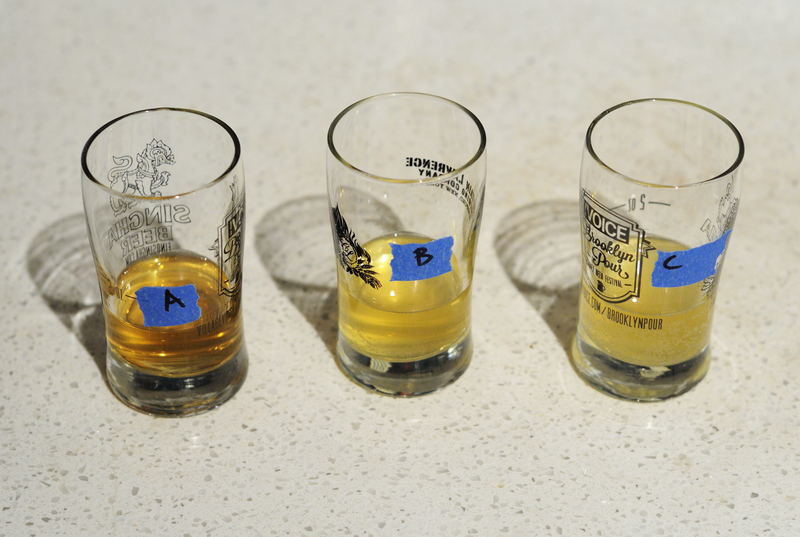 By and large, my favorites are those that focus on creating a pleasant and complex fruity character rather than a horsey, phenol-heavy Brett character typically produced by many strains. I’m not a huge fan of that type of aggressive phenolic Brett character, which I find to be at times overly harsh and perhaps even biting. I think this is one of the biggest mistakes being made by contemporary brewers trying to make funky beers. Bigger Brett character is not always better. 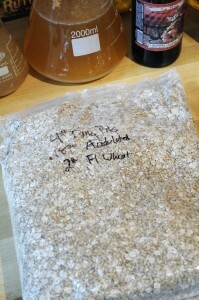 The key to this beer recipe is the oats which provide a nice silky component to what could otherwise be a very dry, thin beer. Even more important is achieving proper fermentation character. In my brewery, I am achieving this by utilizing a mixed culture which I’ve been propagating over a number of generations. The culture is composed primary of fruit-heavy Brett and Sacc strains, as well as a touch of Lactobacillus, which is kept in check through the IBUs in the beer. 1L Starter of my house saison culture. The mixed culture is made up of cultured Saison Dupont dregs, The Yeast Bay’s Amalgamation Brett Blend, and White Labs Lactobacillus Brevis. Judged as 2015 BJCP Category 28A. Brett Beer. This is a very fruity expression of Brettanomyces. The beer’s fermentation character dominates the aroma, imbuing the beer with impressions of ripe fruit — cherry, honeydew, and even some tropical pineapple. A very light phenolic pepperiness is in the background with only the faintest hint of rubber. The malt character is very minimal and clean. There is a light tartness on the nose and just a hint of acetic sharpness. As the beer warms, some hot alcohol comes out which detracts slightly. Beautiful deep gold with brilliant clarity. A large fluffy white head forms, but quickly dissipates — likely attributable to the Lactobacillus in the mixed culture. The overall flavor is really clean considering that this is a mixed-fermentation beer. There is a touch of a leatherlike earthiness from the Brett, but most of the fermentation character is bright and fruity. The malt is really crisp and nice — like a good German pilsner. The beer is about six months old at this point and only has a hint of the Cheerio character it had exhibited only a couple months ago — something I attributed to THP from the Brettanomyces ferment. There is a touch of acidity to the beer that is quite pleasant — not something I’d consider ‘sour’, but more of a complementary note to the fruitiness. The beer is very dry, but there is a bit of roundness to the body that prevents it from being too austere. There is a nice mellow acidity that combines with a relatively high carbonation to give a bright clean finish to the beer. I am really happy to see how my house saison culture is expressing itself in the beers fermented with it. The Brettanomyces personality of this beer is much more in-line with ripe fruit than the earthy funk that can sometimes dominate Brett beers. I have typically been keeping my house sour culture refreshed with frequent feedings of starter wort. Over the past couple of years, I’ve cultured and grown up bottle dregs from a variety of commercial sour beers to complete several different projects. These dregs are a great way to add biodiversity to the commercial blends (like Roeselare) that I typically start a sour beer with and tend to produce a more interesting final product. As I acquired these cultures, I began combining them with the intent of developing a variety of house-mixed cultures of bacteria and yeast that I can maintain and use to completely ferment out sour beers. The intent is to continue shaping these mixed cultures until they get to the point where they can consistently produce quality sour beer in a predictable time frame. I fully expect the blend of microbes within the culture to drift, but hope an eventual homeostasis will take hold within the culture. Currently, I have built three different mixed cultures around a spectrum of cultured microbes harvested from commercial beers. One of the biggest tasks in maintaining a culture like this is the frequent feedings required to keep a culture viable. The idea of maintaining my cultures through periodic feedings of fresh wort that would eventually provide the steady byproduct of sour beer seemed like a great idea. And so, the idea of a sour culture bio-reactor was born. The idea is pretty basic. I’ve put together a schedule of brew days that in theory will consistently provide nutrition for the culture as well as produce a steady stream of sour beer for evaluation. Every four months I brew a different 3-gallon batch of moderate gravity wort that gets split three ways to feed one gallon of fresh wort to each of my three mixed cultures. On brew day I transfer the previous batches of now fermented beer off the culture to a clean glass aging vessel where it will continue to develop for another 8 months (1-year total fermentation time) before packaging. The cultures are then transferred to the freshly brewed wort for a new round of fermentation. 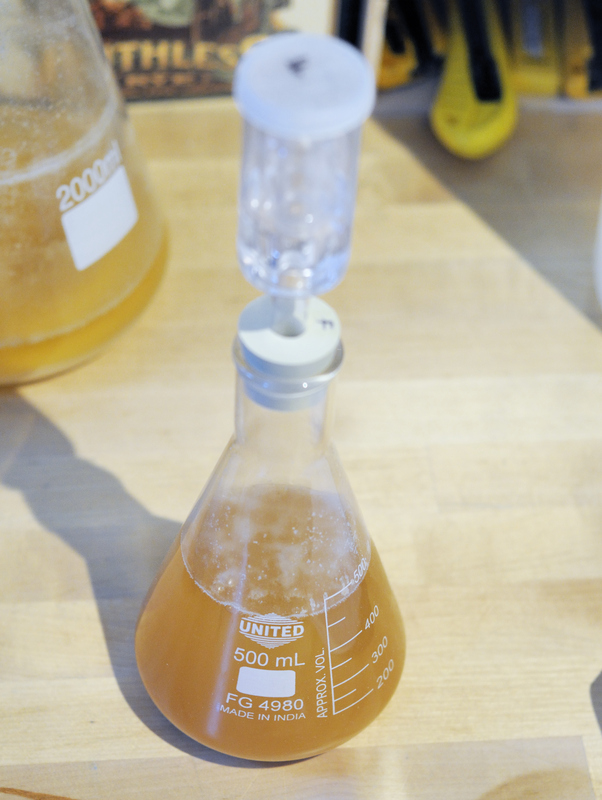 After the initial one-year cycle, the bioreactor will consistently output three, 1-gallon batches of sour beer every four months. The beauty of running three cultures in parallel with the same wort is that I’ll be able to compare side-by-side the impact each different culture has on the finished product. 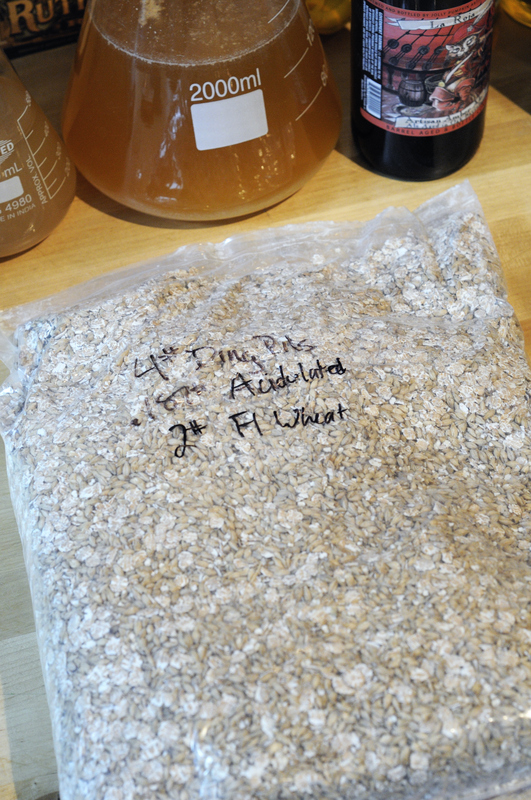 My hope is to experiment with different grain bills to better understand the interrelationship between grain bills, mash temperatures, and mixed culture fermentation. I initially started this project using a single mixed culture. 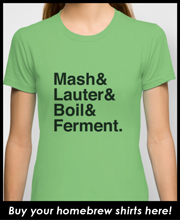 To date, this culture has been through 3 generations of wort. I’ve tasted the first two generations (currently 4-months and 8-months old) and the results have been pretty outstanding; and consistent within the limited sample thus far. I’m optimistic that with some luck and diligence I’ll be able to shape these cultures to the point that they produce sour beer that is both delicious and unique to my brewery. The first round in the bioreactor ready for fermentation. The initial recipe was 90% Pilsner, 10% Carapils, and had a starting gravity of 1.054. Against what may or may not be good logic, I’ve begun a new sour beer project. 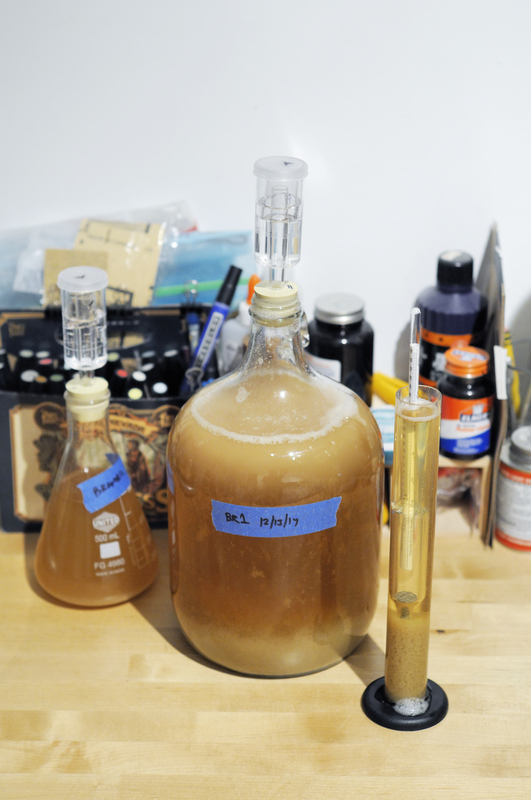 My goal is to successfully create a delicious sour beer fermented only from airborne yeast and bacteria. There is something beautiful about the idea of successfully producing a delicious sour beer that reflects the micro-flora present where I live. I love the tangible connection that can be made with world-renowned Lambic brewers who continue to brew traditional spontaneously fermented beers (as well as American craft brewers like Allagash, Jester King, and Russian River). I am keeping this project as wild as possible; I will not be culturing yeast from fruit, grains, bottle dregs, or any other source, rather only what I can capture across the cool evening breeze. Brooklyn wild. 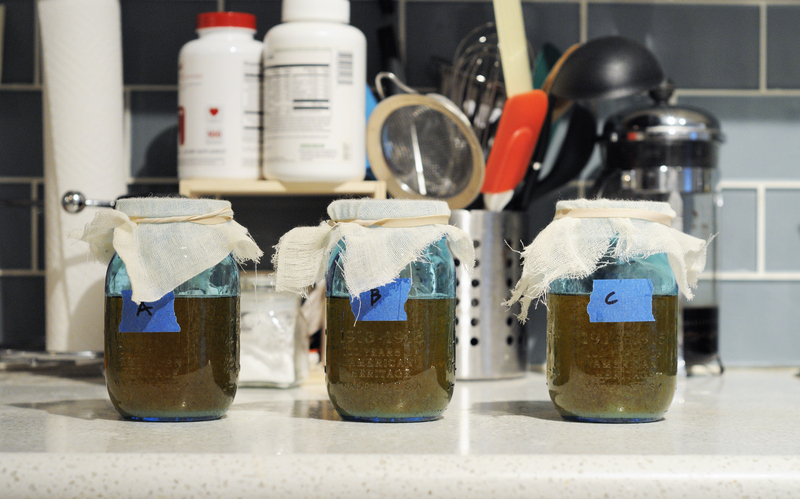 What fermentive creatures lurk in our Gowanus air? The Internet is full of stories both of success and failure when it comes to truly spontaneous beer. Whenever I attempt a technique that includes a high probability for failure, I try to set as many variables in my favor as possible to get a successful end result. There are no guarantees for success in a project like this, but taking a few simple measures can greatly increase your odds. Using this logic, I decided that running multiple samples and testing their qualities before pitching into a full 2.75 gallon batch of beer was the way to go. This was especially important given the fact that I live an dense urban environment with little vegetation and no fruit bearing trees that could be attractive homes for wild yeast. Initially I prepared (3) 8 oz. samples of sanitary 1.030 OG wort and placed them boiling hot into pint sized mason jars. I added 0.3 ml of 88% lactic acid to each sample in order to acidify each below pH 4.5. My goal is to inhibit pathogens from growing in the wort as well as non-pathogenic bacteria that can produce objectionable flavors. Since I would be tasting the wort, I wanted to minimize terrible tasting samples as well as ones that could potentially make me sick. Each of the three samples were placed around my apartment. One was located on the roof of my building, one in front of an open window at the rear of my apartment, and one in front of an open window at the front of my apartment. Each were covered with a couple layers of cheese cloth to prevent any insects from entering the sample and then left to cool for approximately 24-hours. After 24-hours I fitted each jar with a lid and airlock to create an anaerobic environment, providing control of another variable and putting selective pressure on the organisms growing in the wort. 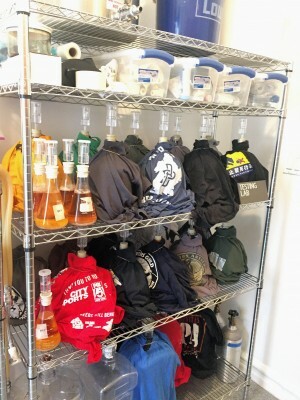 I completed this experiment in the late fall, which according to American Sour Beers offers the best probability for culturing yeast and bacteria that will have a positive fermentation character. After approximately one-month, I completed a sensory analysis of each sample (smell and taste). In hindsight, I should have also taken pH and gravity measurements. Sample A – In Front of Window – Small filmy pellicle. Cabbage, some baby diaper. No apparent alcohol flavor. Sample B – Outside on Roof – Small filmy pellicle. A couple spots of white fluffy mold. Some alcohol on nose. Light rubbery phenol. 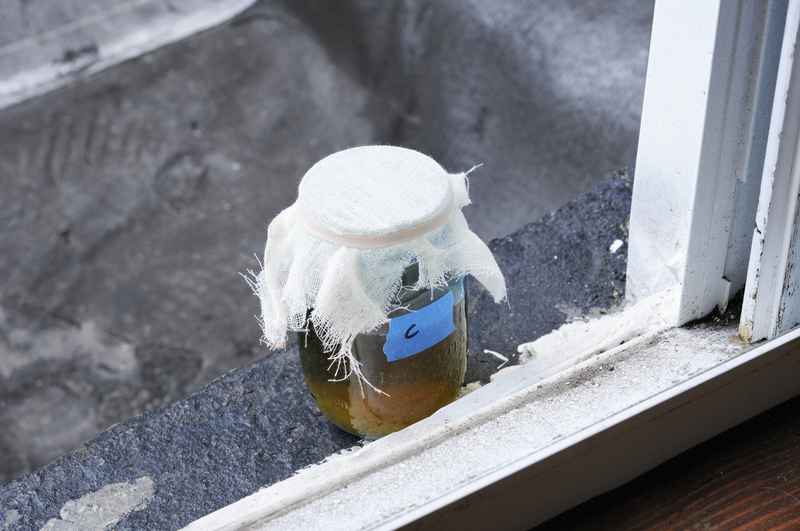 Sample C – In Front of Window – Small filmy pellicle. Cabbage. Some oniony aromas. Pretty sweet, low alcohol. Encouraged by the initial results, I stepped each into a three new 300-ml sanitary starters. Each were allowed to ferment for another month under airlock. Sample A – Very sweet. Didn’t appear to ferment much. Clean. Sample B – Quite sour. Some definite plastic-like phenolics and slight alcohol. Some pleasing barnyard notes. Sample C – Reminiscent of pickle juice. The most sour. Definite alcohol on nose. Not very pleasant. After the second round of fermentation, I decided that Sample B (the sample pulled from my roof) was the most pleasing (or least offensive). I pitched it into a fresh 1200 ml starter (also under airlock) and made preparation to brew a full 2.75 gallon batch. For my recipe, I decided on a simple golden grain bill to act as a clean slate for the culture to express itself. A turbid mash regiment (basically a thin decoction) was completed through the steps below. A Ferulic acid rest was completed to encourage the formation of 4-vinyl guaicol which Brettanomyces can theoretically convert into 4 ethyl-guiacol which produces some of the ‘funky’ aromas and flavors that Brettanomyces is known for. A short Beta rest was followed by a very high Alpha rest to encourage a dextrinous wort and protracted secondary Brettanomyces fermentation. The beer will be allowed to ferment for at least a year until packaging.